You may have read in the past week about the abysmal take up of Shared Parental Leave (SPL), a policy introduced a year ago to allow parental leave to be split between parents, rather than having partners restricted to a maximum two week period of paid leave. The Telegraph, the Guardian and Sky News, among others, all reported that in the past year, only 1% of men have taken up this opportunity. The Telegraph article muses over the possible reasons, which include “it being ‘financially unworkable’, ‘a lack of awareness,’ and ‘women…refusing to share their maternity leave.’” All of which may well play a part, but I bet none of them play as big a part as the fact that the vast majority of the men referred to by the results weren’t eligible for SPL because they weren’t fathers of children born in the last year. It’s important to note that we have reported the figures against ALL male employees as the majority of companies were unable to tell us the size of their male populations that were eligible for Shared Parental Leave. So the fact that most men haven’t taken SPL is about as newsworthy as the fact that I haven’t, as I’m pretty sure if I applied for it at work, they’d want some sort of evidence that I was having a child. Helpfully, Adam Nuckley has done some work on the numbers and has estimated in a post on LinkedIn that 21% of eligible men took up SPL last year. This certainly isn’t a figure set in stone, as it’s extrapolated from the survey, which is based on reported estimates from a relatively small sample of 200 employers. Presumably at some point real figures will be available as I assume the government will release them once the data has been processed. But for now, let’s be content that it’s probably a leap above the 1% that so many media outlets misreported. If it is actually nearer to 20%, then to me that would read pretty successfully for the first year, given how reasonable it would be to expect modest take up at this early stage. Many people might be unaware of this sort of change, or might have planned their approach before it came into force. There’ll almost certainly be a settling in period, where take up is at its lowest, with people getting to grips with it and some waiting to see success stories before jumping in themselves (which is one of the reasons why it would be helpful to have media coverage that points to where SPL has worked and been used rather than misusing data for shock value). And on top of this, through everything, there is the assumption that is fed to us constantly and that explains why fathers haven’t had this option historically: women are the caregivers. Legal changes are very important and I’m delighted that SPL enables partners to take a much more substantial part in their children’s upbringing than was previously possible. Without this, for even the best meaning fathers in paid employment, it was often economically ludicrous to stay at home. Now, there are options on the table. However, for this to have an impact, the normalisation of men bringing up their children needs to be a thing as well. Couples need to be empowered to have a real conversation about how they want their leave to work, without the fear that they’re doing the wrong thing if the mother goes back to work, or that the father would be making an unthinkable sacrifice to pause his career and stoop to caring for their child. It’s difficult. It doesn’t happen overnight or in the space of one year. There are plenty of things that would help though. Employers should be as clear and transparent as possible about the options for parents and ensure that they enhance SPL to be equivalent of maternity leave. Companies that aim products and services at parents should be inclusive of fathers. If you’re going to be a parent, you can discuss it with your partner. If you know somebody who’s going to be a parent, you should avoid assuming that the mother will be the one taking all the leave. And if you’re a media outlet, you can stop reporting misleading statistics that make the policy sound like a failure, when there is no evidence for your claims. Author’s note: the survey focused on men taking up SPL and due to this and the gendered nature of childcare, this post has focused largely on couples with one woman and one man. However, SPL is also available for women couples or men couples. 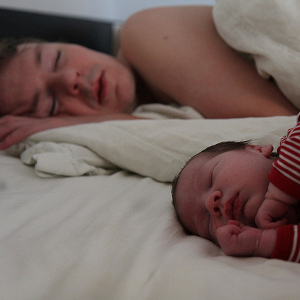 The photo, ‘Father and son’, is by Sakena All and is used under a creative commons licence. 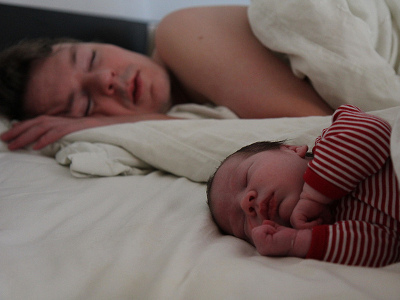 It shows a man asleep on his side under the covers in bed, with a baby also asleep in a similar position next to him.